The VC, Prof. Olusola Oyewole (Left) in a warm handshake with Prof. Segun Osinowo while monitoring the Screening Exercise for Second Batch Candidates. 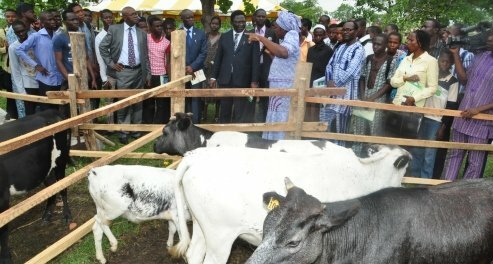 The Federal University of Agriculture, Abeokuta (FUNAAB) has concluded the screening of second batch candidates for the 2012/2013 Academic Session. The 2-day exercise which began on Wednesday was monitored by the Deputy Vice-Chancellor, Academic, Professor Toyin Arowolo. Speaking in a chat with FUNAAB Bulletin, the Deputy Vice-Chancellor, Academic, disclosed that a total of 695 candidates were considered for the exercise. He stressed that the University would admit 3,500 students out of the over 31,500 candidate that wrote the post-UTME. Fielding questions on the fate of students who applied for admission, based on awaiting result, the Deputy Vice-Chancellor described the development as been beyond FUNAAB, calling on the West African Examinations Council (WAEC) to consider shifting the examinations to March and April in order to give enough time for candidates to get their results and apply properly for admission into higher institutions of their choice. Professor Arowolo who disclosed that the new directive from the Federal Government has made it mandatory for all universities to normalize their academic calendar said, FUNAAB is on course. According to him, by the Calendar, freshers are expected to arrive on Sunday, September 9, 2012 while ICT training will hold from September 10th -28th, 2012. In a separate chat with FUNAAB Bulletin, some prospective students expressed confidence on FUNAAB Management’s ability to conduct a credible screening exercise. Abdulmalik Babatunde, a student seeking admission into the Department of Economics, College of Management Sciences (COLMAS) said “it is a well known fact that FUNAAB gives admission based on merit. I have confidence in the screening exercise”.